As you may know, Dr. Cooper coined a word in 1968 that he used to describe a new exercise program to improve heart health. Little did he know that he would spark a global fitness revolution! That word was aerobics. The phrase Get Cooperized encompasses the fitness movement Dr. Cooper started, but also expands the movement to encompass eight areas that make up a well-rounded, healthy life. Being Cooperized means living a healthy life, the Cooper way. Get Cooperized is the heart of our mission. It’s the sum of our eight entities. And it’s a set of eight general guidelines to achieve and maintain health. Each one can be and should be customized to fit you—your body, your health, your interests, your life. You are considered normal weight if your BMI is 18.5-24.9, overweight at 25-29.9 and obese if it’s 30 or higher. BMI may be inaccurate if you are highly muscular; in that case measurement of body fat by calipers may be more accurate. Maintaining a healthy weight is one of the most important things you can do to prevent illness and disease, enjoy a higher quality of life and live longer. But we know that it takes a combination of good nutrition and consistent exercise to do this. Read some of our health tips on weight loss, and check the Get Cooperized guidelines on eating healthy most of the time and exercising most days of the week. Eat healthy most of the time. We like to say it’s about moderation, not deprivation. Or eat healthy 80% of the time and have that cookie the other 20% of the time. We know that’s a big bite to swallow, so what’s the first step to building healthy nutrition habits? We’d say eat more fruits and vegetables daily. There is an adage, “Five is fine, but nine is divine.” That’s talking about servings (one serving is half a cup) of fruits and veggies to consume every day. If you’re not getting five servings in a day, start there, then work your way to nine. Research shows that by doing this, you can lower your blood pressure and cholesterol and are at a lower risk of stroke, heart failure, osteoporosis, and kidney stones. Check out the Nutrition Bites section for great articles by our registered dietitians on a host of topics. We also offer some of our favorite healthy recipes. But if you need individualized, expert advice, learn more about our Cooper Clinic Nutrition Services. “Moderate physical activity” – Moderate intensity should get your heart rate elevated to where you can talk but you’re winded. There are many types of cardiovascular exercise: take a brisk walk or go jogging, kick the soccer ball with the kids, play a game of touch football, swim some laps, jump rope, hop on an elliptical machine. Whatever you choose, just get moving! “A collective 30 minutes a day” – Here’s the good news. You don’t have to exercise for 30 minutes straight if your schedule doesn’t work or those bad knees won’t last. You can do three spurts of activity for 10 minutes each or break it into two, 15-minute intervals. It all adds up and it all counts! And a total of 30 minutes is a realistic amount of time to fit into your schedule. Put it on your calendar like it’s an appointment and stick to it. “Five days a week.” – This is important because if you do 30 minutes of moderately intense cardio over five days you will have logged 150 minutes of exercise. This is the magic number to reap the benefits of heart health, prevent diabetes, cancer and other diseases, and improve the quality and quantity of life. For some great articles by our professional fitness trainers, check out our Fitness Files or watch videos of our Exercise Moves. Of course, if you want to work directly with one of our trainers or sports professionals, visit the Cooper Fitness Center in Dallas. Take the right supplements for you. Supplements are just that, they are supplements and not replacements. You have to start with a good, balanced diet and then think of supplements as an insurance policy. No matter how hard we try, most people are not getting the proper amounts of vitamins and minerals their body needs through diet alone. Generally, we just don’t eat very well. Less than a third of Americans are getting at least five servings of fruits or vegetables a day. Our diets are incomplete. 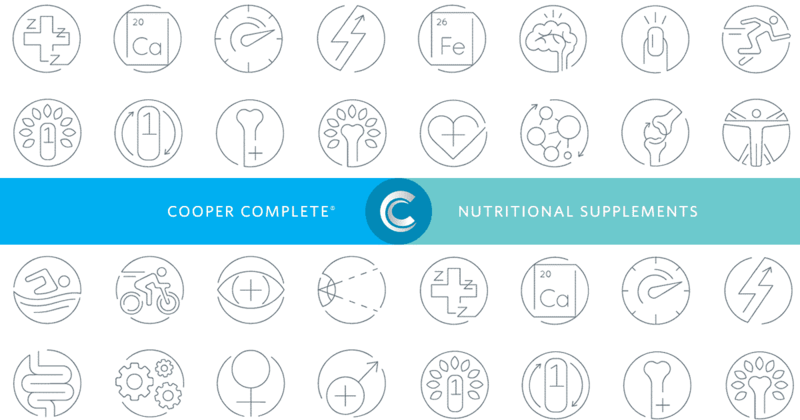 That’s why we created Cooper Complete® nutritional supplements. So start with a good multivitamin that is taken with meals. This will cover a lot of your basic supplement needs. Then get your blood levels checked to understand if you are deficient and need additional supplementation. Research shows the majority of people are vitamin D deficient, which has been linked to diseases such as hypertension, depression, diabetes, certain cancers, and arthritis, to name a few. Studies have also shown the benefits of omega-3 in blood pressure, triglycerides, cholesterol, metabolic syndrome, and cognitive health. Since 1997 Dr. Kenneth Cooper and a team of expert consultants from four leading universities have been studying nutritional supplements and what role they play in health and preventive medicine. That research led to the formulation of Cooper Complete. No matter what brand you choose, make sure your vitamins and supplements are pure and potent. Do not use tobacco. We all know that smoking is “bad” for you and a leading cause of lung cancer. But all tobacco products, not just cigarettes, can threaten your health. Tobacco is associated with a number of different types of cancers, including esophageal, cervical, stomach, kidney, pancreatic and more. On top of that, tobacco is the number one treatable cause of cardiovascular disease, which is the leading cause of death in America. We strongly recommend not using any form of tobacco. Research shows that if you smoke a pack of cigarettes a day, you have a 20-fold increased risk of developing lung cancer. And it doubles the risk for heart attacks compared to a nonsmoker. People tend to think that smoking simply shortens your lifespan—that you may die a few years earlier due to your habit. But the bigger problem is the 10 to 15 years before death where you suffer the terrible health effects of smoking—dealing with cancer or lugging around an oxygen tank to help you breathe. It’s never too late to quit using tobacco. And the sooner you quit, the better your long-term prognosis. If you’re looking for support to help quit smoking, these organizations may offer personalized help or listings of classes and support groups in your community. Control alcohol. This one is always a mixed bag. There are both benefits and drawbacks to consider when it comes to alcohol. Among other things, excessive alcohol can cause weight gain, damage your liver and your heart and increase the risk of developing some types of cancer. Yet for some people, moderate alcohol intake may also have a benefit for the heart. If you sum up the benefits of other healthy lifestyle changes, such as exercise, alcohol consumption as a health benefit would be considered minor. Dr. Cooper always says, if you don’t drink, don’t start. There is no research to say that you should. But if you do enjoy alcohol, moderation is key. Men should have no more than 10 drinks per week and women should have no more than six drinks per week. You need to stretch those drinks out over the course of a week, not pile them up on one weekend. And, as always, keep in mind portion size. One drink is the equivalent of a 12-ounce beer, 5-ounce glass of wine or 1.5 ounces of liquor, which has approximately 15 grams of alcohol. Read more about the effects of alcohol on blood pressure, cardiovascular disease, and your overall health. Manage your stress. We all get “stressed out” at some point. It’s part of life. Yet you may not realize how dangerous it can be to your health – both physically and emotionally. Stress can raise blood pressure and resting heart rate and lead to weight gain. Every single one of these things can cause cardiovascular disease. And if it goes untreated, long-term stress can cause even more medical problems. But, as Dr. Cooper says, it’s not stress that kills, it’s the way you handle it. The best way to control stress? Exercise. Physical activity reduces stress and improves health in so many different ways. It can boost the mood, improve energy and significantly improve both the quality and quantity of sleep. In fact, a study by The Cooper Institute showed that doses of physical activity were as effective as taking prescription drugs for mild to moderate depression. Get ideas for how you can relax and de-stress in our Stress Less section. If you’re in the DFW area, visit Cooper Spa in Dallas for a therapeutic, relaxing massage. Get a regular, comprehensive physical exam. Our philosophy is simple: It’s easier to maintain good health than to regain it once it’s lost. The only way you can improve your health is if you have a comprehensive, in-depth picture of the current state of your health. And that starts with a preventive physical exam. At a minimum, you should “know your numbers.” These are your laboratory results from your blood work, and they contain vital information for your health. To start, make sure you know your cholesterol, blood sugar and blood pressure. At Cooper Clinic, we look at the whole person including lifestyle and health behaviors to inform and direct medical care. Our physical exams are unlike any other. Completely customized based on your needs, all tests are onsite, giving you same-day results. Patients also receive an in-depth consultation with their physician—up to one hour—to go through any questions and develop an action plan. We recommend a baseline comprehensive physical exam between the ages of 35 and 40. Between ages 40 and 50, you should receive an exam every 12-18 months depending on risk and ongoing health or behavior issues. Annual exams should begin at age 50. Many medical issues are completely preventive. Our physicians offer free health tips in our Prevention Plus section. If you’d like to schedule an appointment at Cooper Clinic, fill out this form or call us at 972.560.2667 (COOP).